8 Simple Tips To Grow Your Best Tomato Crop Ever. Period! 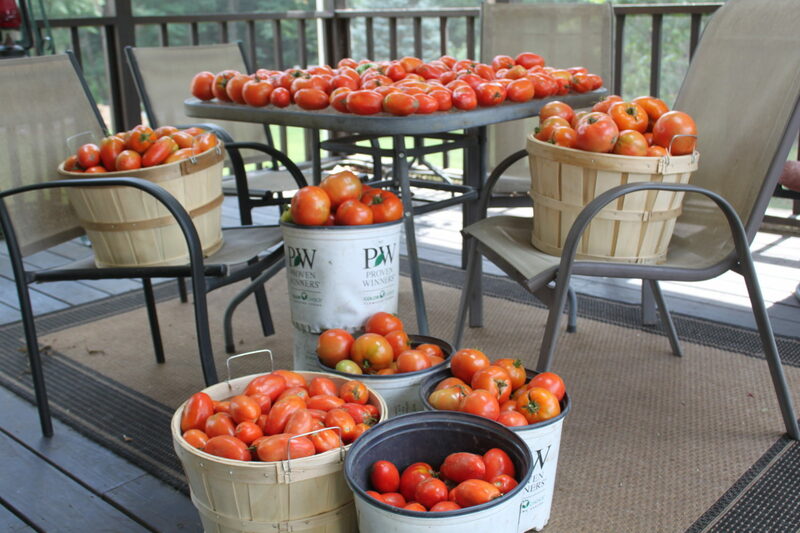 If you are like most avid vegetable gardeners, you are always searching for new ways to grow your best tomato crop ever. With a few simple steps, you can be on your way to your best tomato crop ever. And with good reason! Ripe, juicy, tomatoes are amazing to eat, especially fresh from the vine. But a great crop of tomatoes can provide gardeners and families much more than just a topping for a hamburger or salad. Our tomato crop also provides us with year round homemade salsa, pasta sauce, ketchup, barbecue sauce, as well as chili and tomato soup. So what does it take to grow a great crop? Well, obviously a little help from mother nature in the way of good sunshine and timely rains are a big plus. But beyond good growing weather, there are some simple, proven methods below to growing a great crop every year. Tomatoes are notorious for becoming susceptible to soil-borne disease. One of the best ways to thwart that is to rotate and move your crops every year. 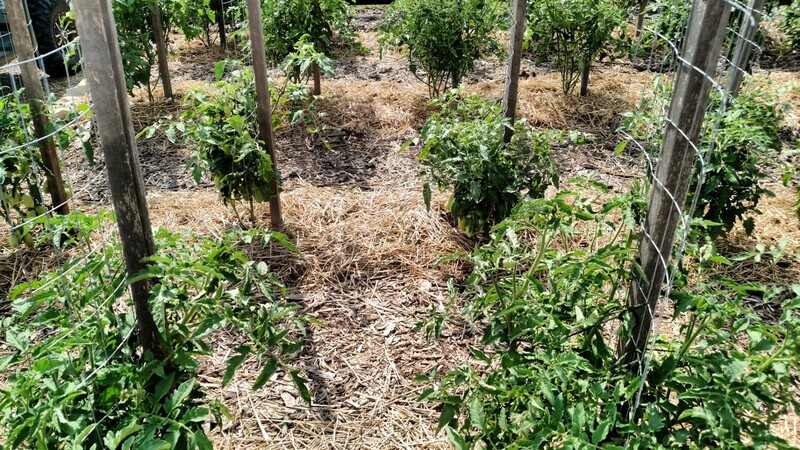 Crop rotation is a major key to successfully growing nearly all vegetables – especially tomatoes. In fact, tomatoes should never be planted in the same exact soil for at least 3 years, 4 is even better. If you grow in pots or containers, that also means making sure to completely change your soil every growing season. #2 Create A Great Planting Hole With Extra Nutrients! Tomatoes need a lot of nourishment to grow strong and produce big yields. So get them off to a great start with a fertile planting hole. Start by digging your hole at least 8″ down to loosen the soil . We use a post-hole digger to quickly make a beautiful, deep hole. Then create a great soil mix to fill in the hole as you plant. Mix in a cup or two of compost, a few crushed egg shells, and a couple of tablespoons of spent coffee grounds and about a 1/2 cup of worm castings with the soil going back into the hole. You won’t believe how much your tomato plants will thank you! The eggs shells provide much-needed calcium to the tomatoes as they break down, helping to stave off common tomato issues like black rot and blossom rot. 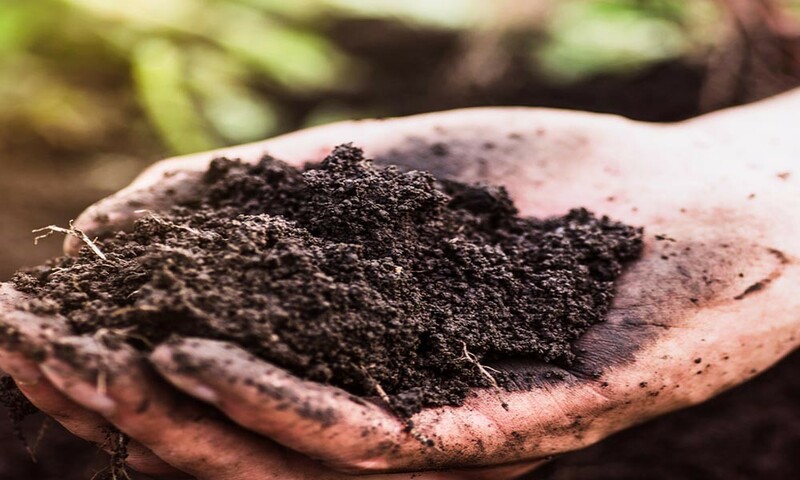 The compost, coffee grounds and worm castings provide nitrogen and great soil structure to absorb water and nutrients from the soil. After using worm castings, I simply can’t say enough about what they can do for plants! And while you are planting – plant those transplants deep! All the way up to and including the first set of leaves on the plant. This allows the tomatoes to grow strong roots deep in the soil. Helping them against drought, and temperature fluctuations. Mulching plants and providing support are big keys to a great crop! Use a thick mulch of straw, shredded leaves, compost, or even grass clippings around your plants. How thick? We like to put a 2 to 3″ deep layer about 12″ in diameter around each plant. This helps them to retain moisture and keep out weeds. Keeping weeds at bay is important. They use up important nutrients in the soil that the tomatoes need. I really like using compost here – it is a great mulch, and it gives nutrients back to the soil each time it rains as the water leaches through. Tomatoes love water – but not too much. Be careful not to over-water. If your plant leaves are turning yellow, they may be getting too much H2O. We like to water our young plants the first 3 to 4 weeks about every other day with about 1/4 gallon of water per plant – if mother nature isn’t helping. As they get more mature, we back off that unless they are showing signs of wilt, and then we may water with about 1/3 of a gallon per plant every three days if there is no rain. Fewer, but deep watering like this allows the roots to grow deep and not stay on the surface for water. That results in a much healthier plant. Tomatoes can really benefit from a boost or two of fertilizer in their early growing period. We apply a 1/4 gallon of compost tea or worm casting tea liquid fertilizer to each plant between the 2nd and 3rd, and 5th and 6th week after transplanting. After the first few applications, we let the great soil in the planting hole take over the rest of the way. This is a BIG one! Be sure to provide your plants a sturdy support to grow up on. 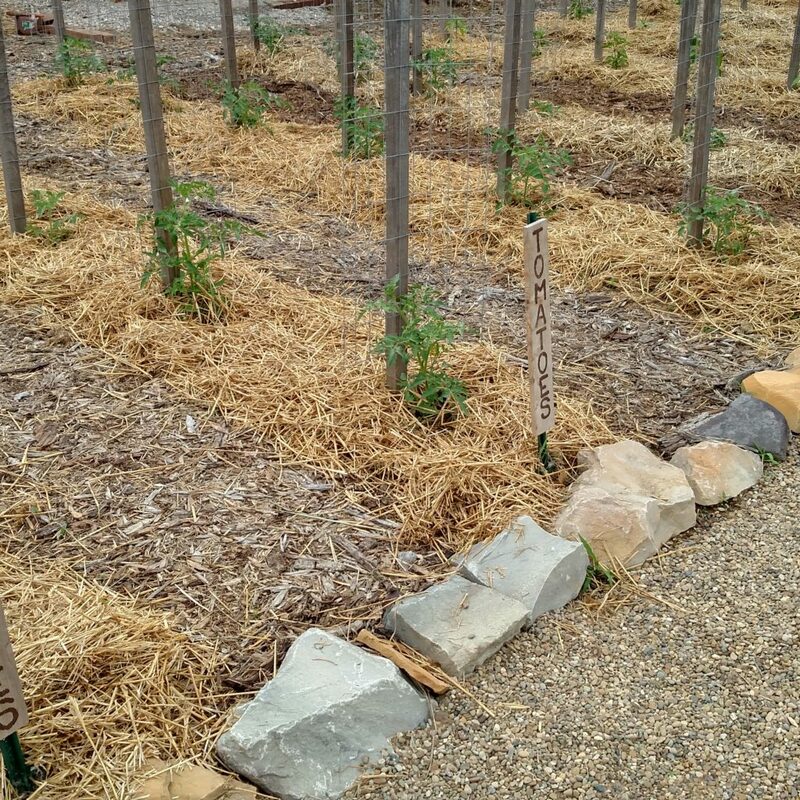 Tomato plants left to sprawl on the ground are easily damaged by foot traffic from you, pets and animals. They also are much more susceptible to disease, mold and fungus. We use our homemade Stake-A Cages, which are inexpensive and easy to use. 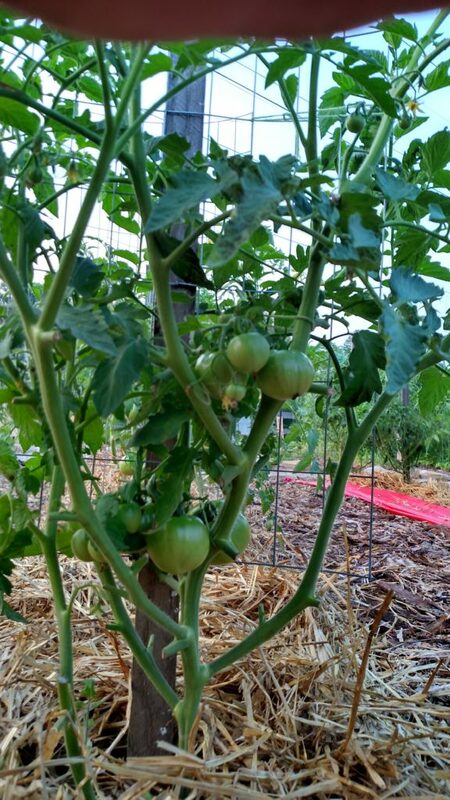 Pruning out space at the bottom and a few in the middle allows for good air circulation and light to the plants – a BIG key to growing your best tomato crop ever. As your plants grow, prune off the bottom 6 to 8″ of stems from the main stock. This allows for good air flow and easy watering of the plant. By clearing out the area around the bottom of each plant – you are reducing the ability for plant feeding insects to find their way up onto the plants, and the improved circulation helps cut down on the chance for fungus to develop on the plants, and improves the ripening process. As the plants grow larger by mid summer, remove some of the more wild top and middle stems from plants to allow for more air circulation and to aid ripening. As a final tip, we can’t say enough about starting with good plants. Whether you grow your own from seed, or purchase from a nursery – use good quality plants and plant good proven varieties. Great choices for slicing and eating are Brandywine and Celebrity Beefsteak. For sauces and salsa – San Marzanno, and Amish Paste, are two of our absolute favorites. They are all great for canning too! For more great varieties, check out our article 10 great Heirloom Tomatoes To Grow. Grow your best tomato crop ever. Happy Gardening! – Jim and Mary. We hope you enjoyed this week’s gardening article! If you would like to receive our DIY, Gardening and Recipe articles each week, you can sign up to follow the blog via email in the right hand column above, “Like” us on Facebook, or follow us on Twitter. This article may contain affiliate links. What would be good crops to plant to give a previous tomato area a rest? We have lost our garden spot this year and live in an apartment, can you possible tell me the best tomato to grow in pots on our porch and what kind of potting soil we need to use. Thank you very much, I so enjoy all of your articles. Space…. I would add space to the list. This is where I usually fall short. I get carried away and plant 59 tomato plants and put them too close together. No matter how far I space them, once August shows up it seems like they are always too crammed together.